This selection of wooden garden arbors and arches from Ruddings Wood are manufactured here in Yorkshire from quality materials. These wooden arches each come with the option of a seat making into a garden arbour. More than one of these wooden arches placed near together could form a wooden garden pergola. This garden arch trellis can be painted to fit any garden décor or painted white for a wooden wedding arch or wedding arbor. Assembly is quick and easy with all the major sections pre-assembled with the arch only 3 sections to place together and the arbour 4 sections, full instructions included. This quality horizontal top wooden arch would make an ideal focal point and entrance to any garden. British handcrafted construction from quality FSC timber. These wooden rose arches are finished with a warm tan wood preservative offer weather protection, if your garden requires a distinct theme the arch can be painted or wood stained to suit your décor. 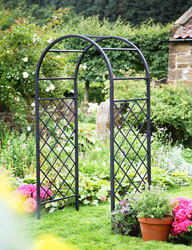 Features of this trellis arch are horizontal top with trellis sides, ideal for most climbing plants to be trained up and over this outdoor arch. These timber garden arch wood sections are 45mm x 35mm. 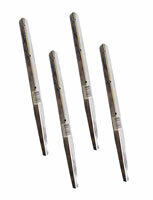 4 Fitting metal anchor pegs for soft ground are available if required. This quality curved top wooden arch would make an ideal focal point and entrance to any garden. British handcrafted construction from quality FSC timber. These wooden rose arches are finished with a warm tan wood preservative offer weather protection, if your garden requires a distinct theme the arch can be painted or wood stained to suit your décor. Features of this trellis arch are horizontal top with trellis sides, ideal for most climbing plants to be trained up and over this outdoor arch. These timber garden arch wood sections are 45mm x 35mm. 4 Fitting metal anchor pegs for soft ground are available if required. This quality horizontal top wooden arbour would make an focal point and place to relax and view your garden. British handcrafted construction from quality FSC timber. These wooden arch arbour seat are finished with a warm tan wood preservative offer weather protection, if your garden requires a distinct theme the arch can be painted or wood stained to suit your décor. Features of this arbour bench are horizontal top with trellis sides, ideal for most climbing plants to be trained up and over this outdoor arch. These rose arbour wood sections are 45mm x 35mm. 4 Fitting metal anchor pegs for soft ground are available if required. This quality curved top wooden arbor are ideal relaxation and view your garden. British handcrafted construction from quality FSC timber. These garden arbour bench are finished with a warm tan wood preservative offer weather protection, if your garden requires a distinct theme the arch can be painted or wood stained to suit your décor. Features of this garden arbour seat are horizontal top with trellis sides, ideal for most climbing plants to be trained up and over this outdoor garden bench with arch. These patio arbours wood sections are 45mm x 35mm. 4 Fitting metal anchor pegs for soft ground are available if required. This pack of 4 x anchor pegs, suitable for all these Ruddings Woods wooden arches and arbours, ideal for use on grass and soft surfaces. Made from steel with a galvanised finish to prevent rusting. Offers support and stability. Click here to see our full range of metal garden arches.